Giant dairy co-operative Fonterra has lifted its forecast milk price for farmers in the current season to $6.75 per kilogram of milk solids. This compares with its opening forecast of $6.50. 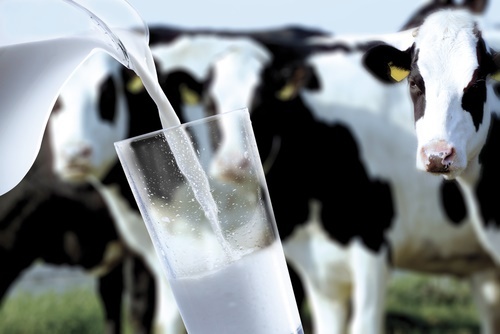 However, at the time the opening forecast was made, economists said given the recent stability in global dairy prices, it was likely that Fonterra would ultimately be able to achieve a figure of $6.75. For the season recently ended, the milk price was $6.15, which was a massive improvement on the just $3.90 price achieved in the previous season when global dairy prices were in a big hole. Farmers will be cheered therefore by the latest forecast upgrade from Fonterra. However, Fonterra also provided the first forecast of its likely profits for the year - and at this stage directors are suggesting there will be no improvement in the earnings. They are forecasting an earnings range of 45c to 55c a share - which is the same as last year. 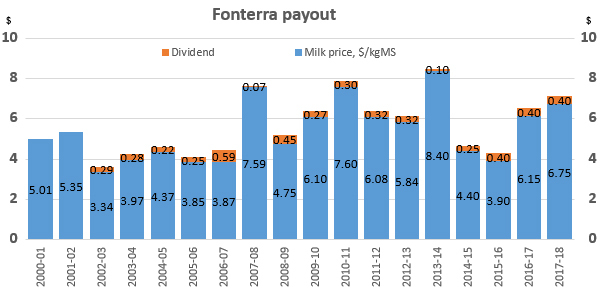 For the past financial year Fonterra's planning to pay a dividend of 40c, so achievement of similar forecast earnings this year would again point to a dividend of around 40c, which, with the forecast milk price would give a possible total return of $7.15. But it is very early days yet. The Fonterra board said guidance regarding dividend payments would be provided as part of the interim financial results "and will be considered by the Board in accordance with its dividend policy". Chairman John Wilson said the revised forecast milk price reflected the ongoing "rebalancing of supply and demand in global dairy markets". "We are seeing growing confidence on-farm across the country and, with global demand for dairy strengthening, the signs are for a good start to the season for our farmers and their rural communities although following a challenging period of very wet conditions for some of our farmers," he said. The increased Farmgate Milk Price would be welcome news to farmers as they continued to invest in their businesses off the back of an improved 2016/2017 season, "with the usual reminder to budget cautiously especially in the early part of the season", Wilson said. Chief executive Theo Spierings said Fonterra was well positioned to take advantage of improving demand for dairy nutrition across the ingredients, consumer and foodservice markets. "Increasing numbers of consumers in our global markets prefer dairy for their everyday source of nutrition, and that is converting into strong demand particularly in consumer and foodservice products." Spierings said the Fonterra forecasts were prudent given that it was still early in the season and the co-operative was starting with very low levels of inventory. "...We are focused on continuing to demonstrate strong business performance so as to bring greater returns for our farmers." That faint rumble you hear isn't Gaia having one of her Wobbly Moments. It's the Fuel, Feed, Fert and Fencing suppliers dancing a little jig - who else d'y'all think makes the real munny?